This Recipe For Carrots Makes It Easy! 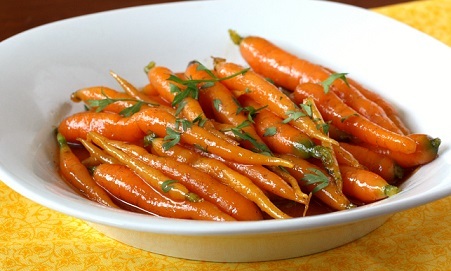 This restaurant Glazed Carrot Recipe makes it easy to eat your carrots! Parents often used to say this line to encourage children to eat their carrots. 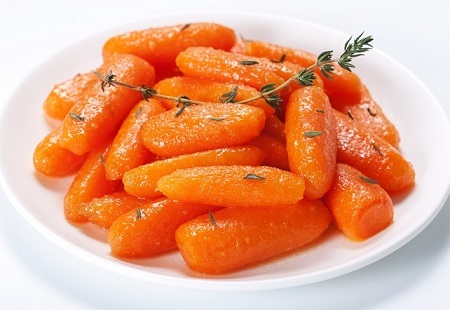 Carrots are, in fact, a good source of Vitamin A which is important for your health, including your eyes. But eating carrots will apparently not actually improve your eyesight. They will help to sustain it, however. Where did parents get such a notion? The growers and processors of carrots? Wrong. Supposedly the British made up this story as a “cover” for why their pilots were so successful shooting down enemy bombers before even reaching the English Channel during WWII. They did not want the enemy to discover they had Airborne Interception Radar. What parents should have done was to acquire some quality recipes to enhance the taste of those cooked carrots such as this restaurant recipe for carrots. Preparation Time: 15 minutes. Servings: 4-6. That's it! 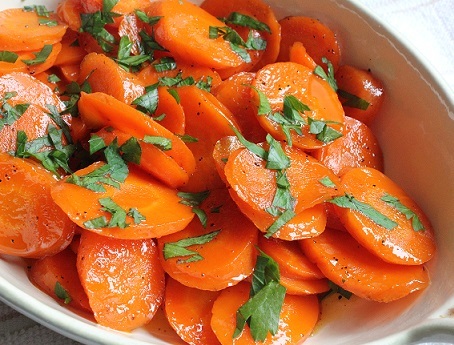 Delicious glazed carrots! Thanks for finding the website. There are many restaurant recipes for you to try besides this great glazed carrot recipe. All these restaurant recipes “work.” How do I know? Restaurant customers have “tested” them and approved them and requested them. It is true for this carrot recipe and every one of the restaurant recipes on this website. Enjoy your glazed carrots and the company you share them with! "If your husband is old and weak you must have him to drink the juice from two big carrots and one firm celery."